Boaters can count on the Regulator 25 to fall right into a good-looking line of great-running center consoles. 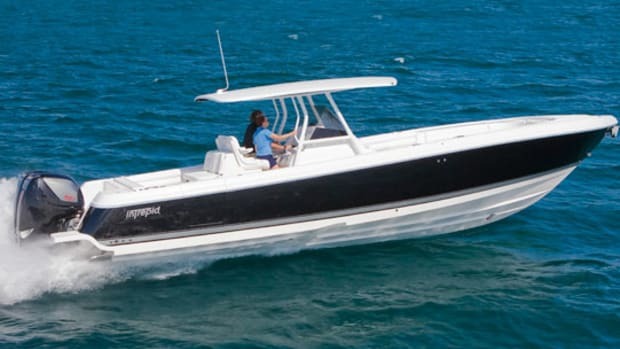 Certain boat brands have built real cachet in some ports of call, and the result is a heavily tilted numbers game as you motor through the anchorage. Regulator Marine plays the game as well as anyone, with droves of them turning up in mooring fields from North Carolina to Connecticut to Cape Cod and beyond. The company has built handsome, seaworthy center consoles in Edenton, North Carolina since 1988, and is currently working to refresh its line with some new models. But don’t worry, you’re not going to see anything outlandish. Case in point, the Regulator 25 has a classic profile and the performance that buyers have come to expect. The Regulator 25 replaces the company’s 26, which was the bread-and-butter of its line, and the new model has many next-generation improvements. Regulator still builds ’em the way it has for the last 25 years: with solid hand-laid fiberglass, using the signature Fiberglass Grillage System of stringers to add strength and rigidity. 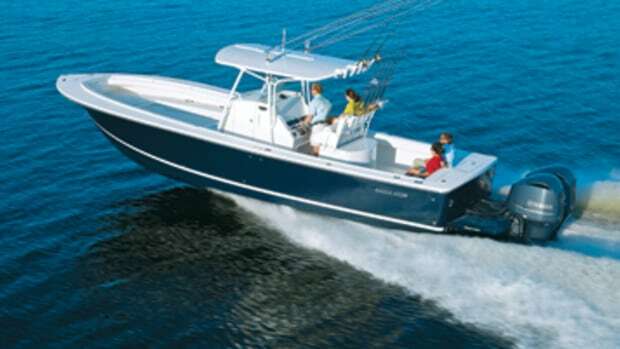 Carolina craftsmen use top-quality materials in the hull, and it shows in the feel of the boat in any conditions you find. 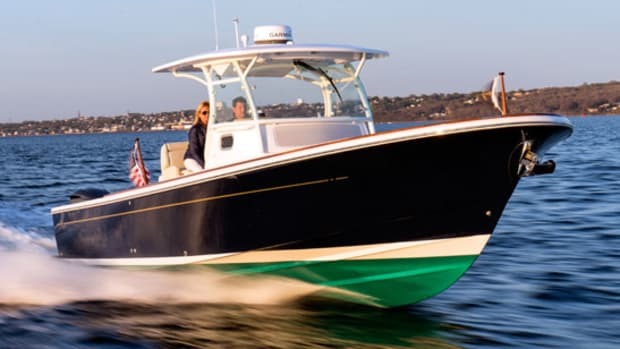 Naval architect Lou Codega designs all Regulators and they share the same proven hull design—a modified-V with 24 degrees of deadrise at the transom. 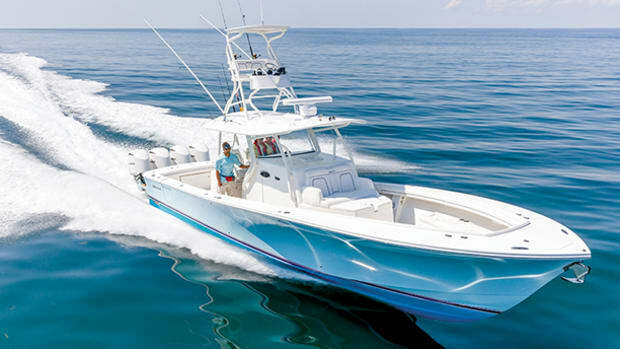 It’s not the quickest center console off the line thanks to the weight of the hull—6,200 pounds dry, with engines—but I’ll take solid and soft any day when the seas get kinetic. Plus she’s not slow by any means. The Regulator 25 incorporates an Armstrong bracket, which the company has used on many models since including it on the venerable 26. 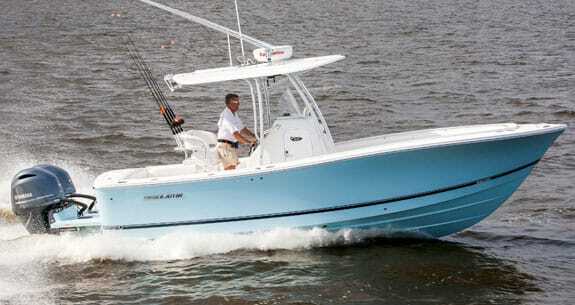 (It also turned up on the just-launched new 23, which replaced a notched-transom hull. Regulator’s 24 and 32 have Euro-transom designs.) 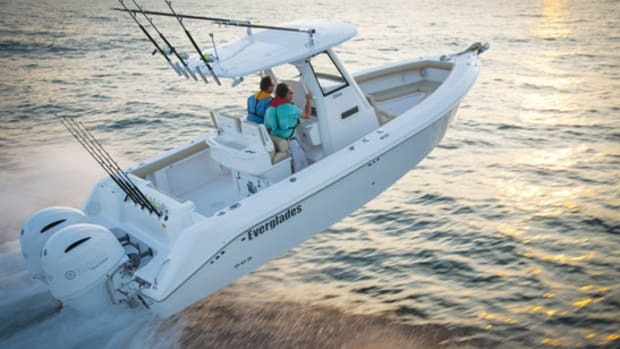 The bracket positions the outboards to do their job better, giving the props cleaner water, and the outboard rigging couldn’t be neater, something anglers appreciate as much as anyone. 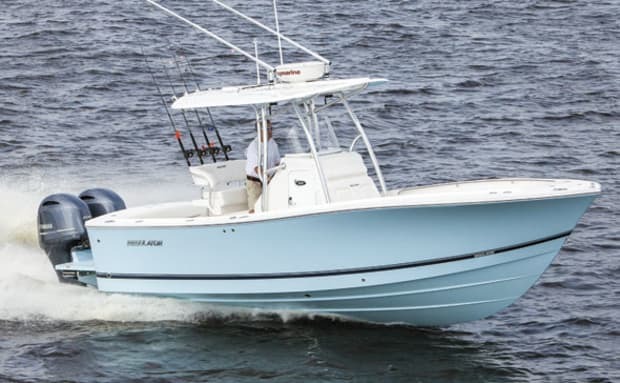 The 25 has a forward seating area with built-in benches and a recessed grabrail, adding family flexibility to the obvious fishing mix. Beneath the cushions are cavernous lockers: port and starboard fishboxes offer dry stowage to the tune of 160 quarts each, while a bow locker holds 140 quarts of volume. Between the benches in the sole we found another locker that holds 408 quarts and has a built-in rod rack. An inspection of the optional T-top revealed gleaming fiberglass finished top and bottom and framed with a beefy set of powder-coated pipes. The test-boat top came with some options, including a powder-coated rocket launcher aft, and molded-in LED lights. Behind the console is a leaning post with helm and companion seats that easily flip up to bolsters, or should I say, bolsters that flip down to seats, since the former will undoubtedly be the default position. My first impression is that this leaning post is tall and thin, simply because it doesn’t look like it takes up a lot of fore-and-aft space, more of what Maxwell was talking about. Our test boat had a built-in tackle station featuring lockers with tackle-tray stowage and cupholders. There was another matched tubular rocket-launcher rod holder smartly integrated with a grabrail (few builders do this as well). When rigged to fish, plenty of gear can be neatly stowed yet easily on hand. There’s a clever transom bench seat that folds out of the way and adds to the seating options. 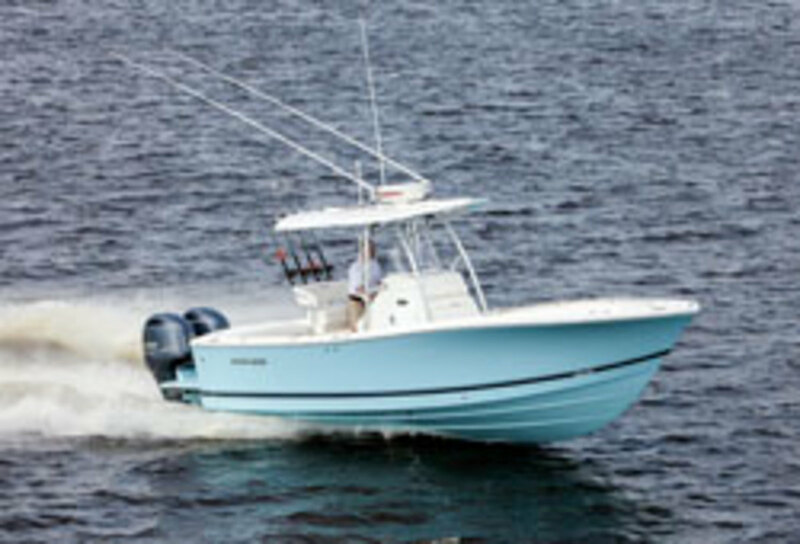 The transom also has a plumbed 23-gallon livewell and 120-quart dry-stowage locker side-by-side under matching lids. Bilge access is through a deck hatch in the cockpit. 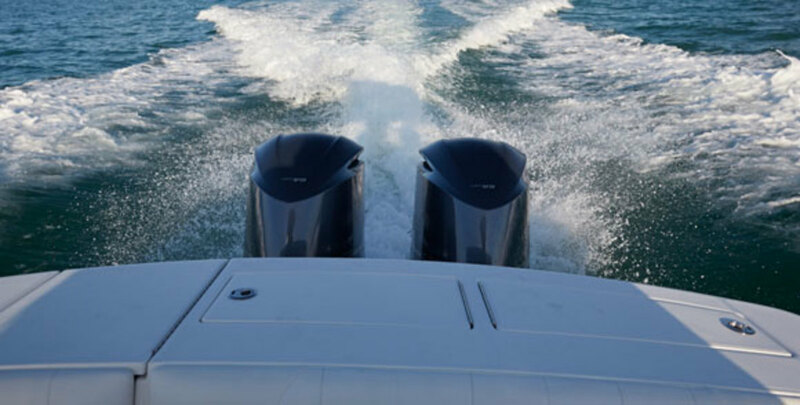 When I say the performance is a known quantity, that’s a good thing, but these twin 200-horsepower Yamaha F200 four-stroke outboards are a delight, offering good economy in the speeds folks actually run in the midrange. As we exited the mouth of the Five Mile River in Rowayton, Connecticut, on our sea trial, Ted O’Neill, sales and business manager at All Seasons Marine Works (www.allseasonsmarineworks.com) stood at the helm and just pushed the throttle levers forward. “There are no surprises,” he said, and glanced at me with a shrug and his best you were expecting something different? expression. Shortly thereafter, the boat managed to get us to 46 knots on a one-way speed run. 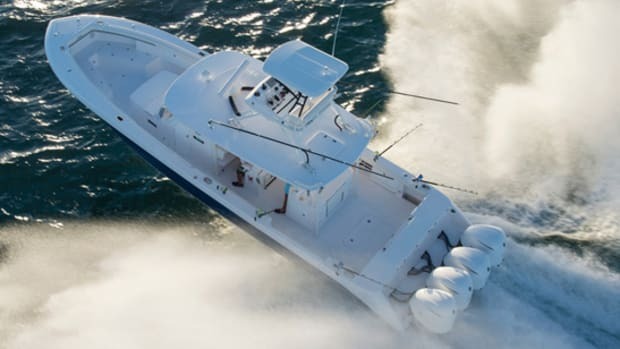 When I got behind the wheel, I found the boat was responsive to the helm and tracked like a champ. 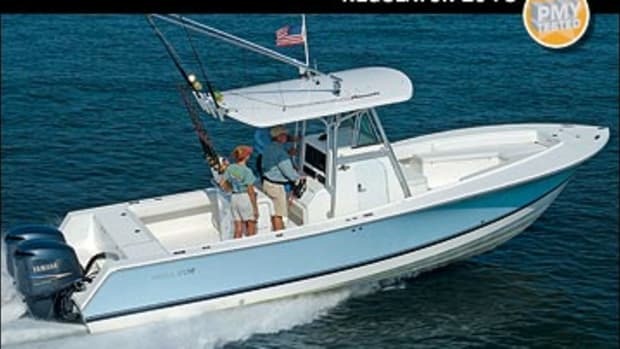 The rough conditions off North Carolina that spawned this design were hard to come by on Long Island Sound but we found the wakes from commercial fishing boats and the Regulator’s modified-V hull slid right through them with nary a bump. 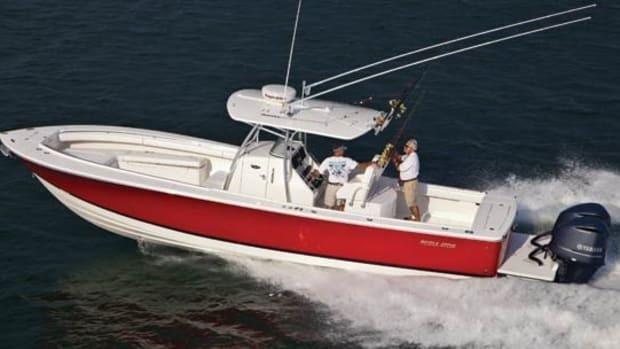 If you’re looking for a center console with a solid feel, a nice turn of speed, and some smart use of onboard space, you may want to think of the number 25. 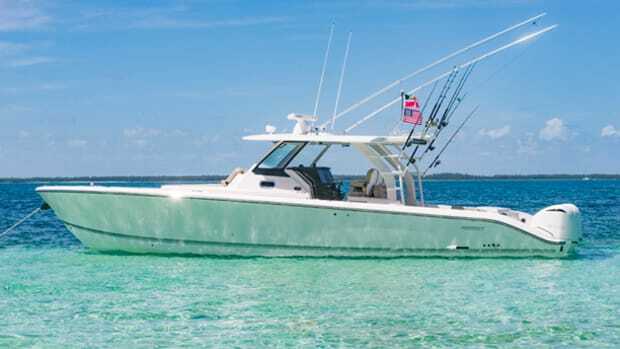 The Regulator 25 came rigged with a pair of 200-horsepower Yamaha four-stroke outboards and you’d be hard-pressed to track down a new-ish specimen of this hull that doesn’t toe the Yamaha line. This outboard is an in-line four-cylinder four-stroke with 2.8-liter displacement, and it tips the scales at 489 pounds. Compare that with the 150-horsepower four-stroke weighing 480 pounds, or the 225-horsepower V-6 that weighs in at 562 pounds and displaces 3.4 liters. These outboards fit in the slot nicely, and, mounted on the Regulator 25’s Armstrong bracket, let that hull jump out of the hole and get to speed in a hurry. 80 gal. fuel, no water, 2 persons, 40 lb. gear.